If beauty is in the eye the beholder, then this Greek yogurt is masterpiece! But we want a mouthful just to make sure. Germany-based yogurt company, Müller has just launched its new ad for Greek style yogurt. The beefy naked model is posing as Atlas when the sculptor gets distracted outside and makes a tragic error with his chisel. One thing is for sure, Müller definite has great taste in models and advertising! 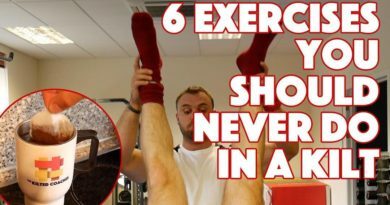 The Kilted Coaches demonstrate “6 exercises you should Never No in a Kilt” VIDEO and SPECIAL OFFER!